Visit a local NYC bicycle shop! Free copies are available at most shops, citywide, as well as at many libraries and community centers. 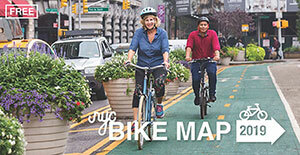 Please take a few minutes to answer our Bike Map User Survey. Your response will help us improve our bike map! Find out more about the Department of Parks and Recreation's bicycling initiatives.